I was recently asked if I could make a Winnie the Pooh Birthday card for a one-year-old. 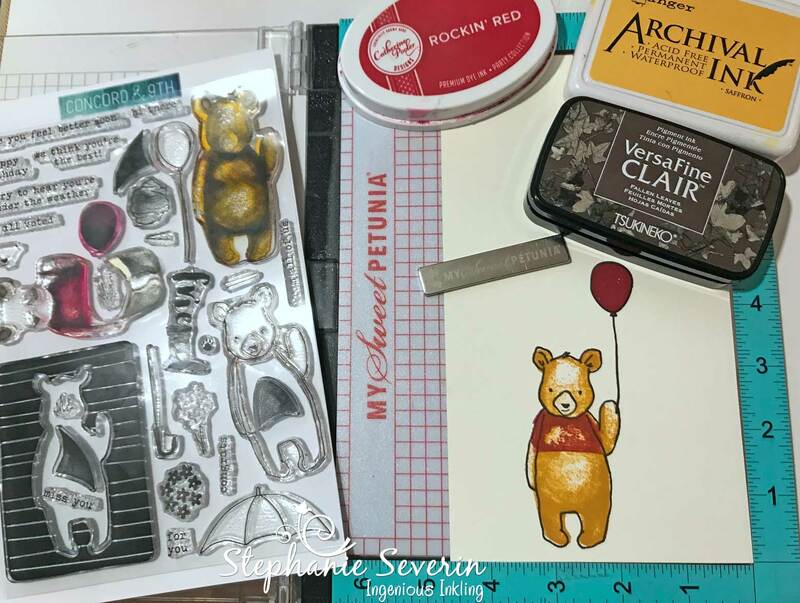 I immediately thought that I could turn Concord & 9th Hi There Bear into Pooh with some creative stamping & my MISTI. 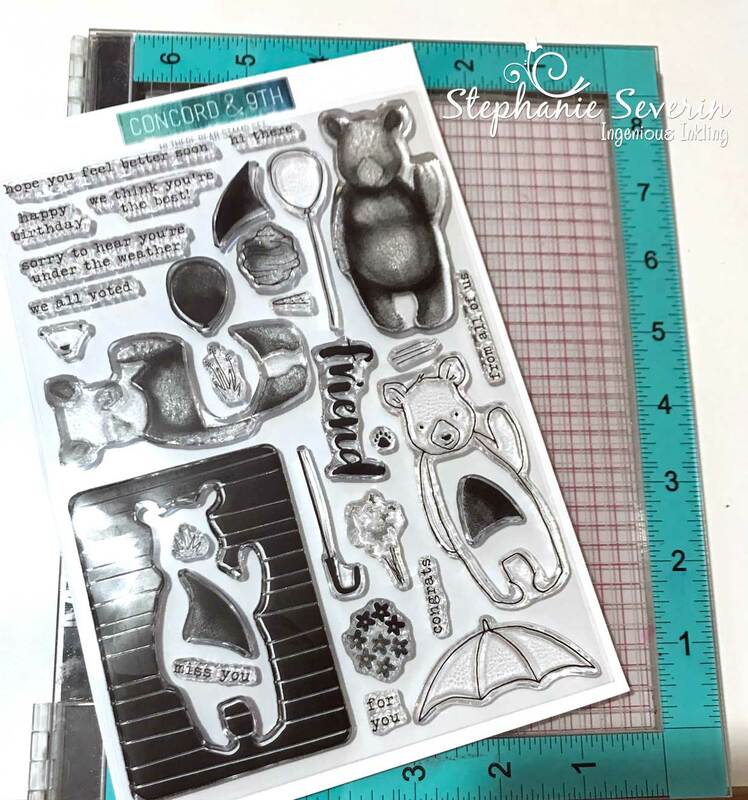 As with all layering stamps, it took a couple of tries to figure out the best order to stamp the layers. 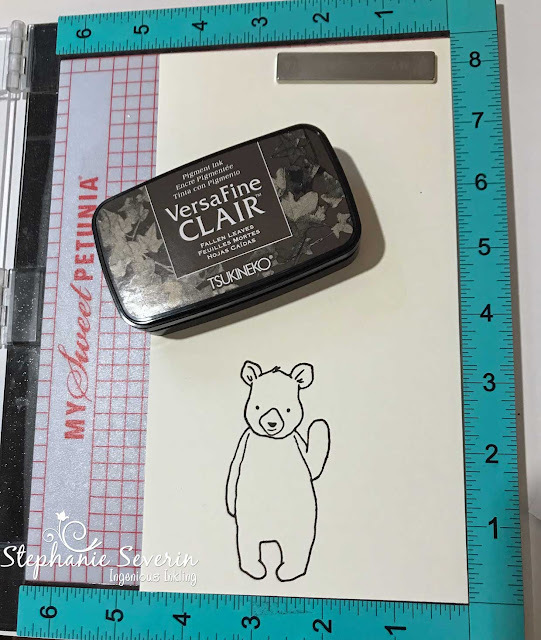 For me, this one worked better if I stamped the outline first with Versafine Clair Falling Leaves. 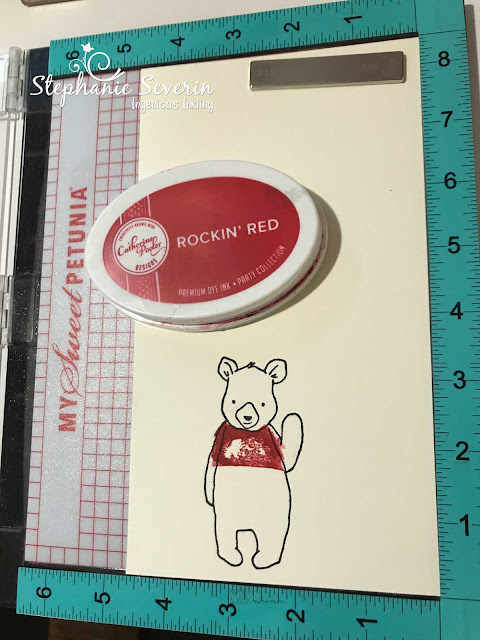 Next I used the stamp that was intended to create a Panda Bear and only inked the top portion with some Catherine Pooler Rockin' Red (again trial and error taught me that the red stayed redder if I stamped it before the gold). Next came filling in the bear. 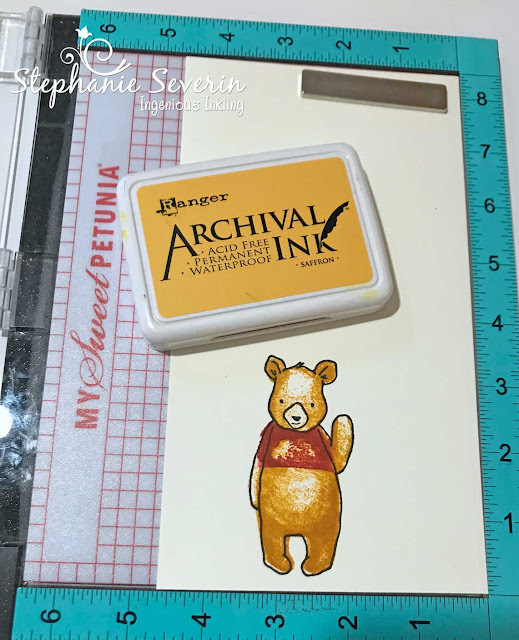 Since I had already stamped the image once, it was stained a bit yellow which actually made it easier to position it insight the lines ... Archival Saffron Ink was the perfect hue for Pooh. And since it was a first birthday, I added a single Birthday Balloon. I stamped the outline first and then filled in with the same vibrant red. I was thrilled with how it turned out ... the bear reminds me of my brother's oh-so-loved Pooh that often joined us on our childhood adventures. 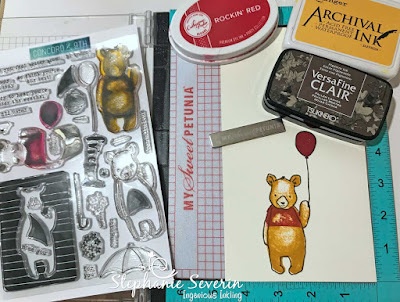 I can't even imagine attempting this type of stamping without my MISTI ... it truly does make new things possible for me. I found a page of a Pooh book online and printed it out to use with a sketch from The Paper Players. 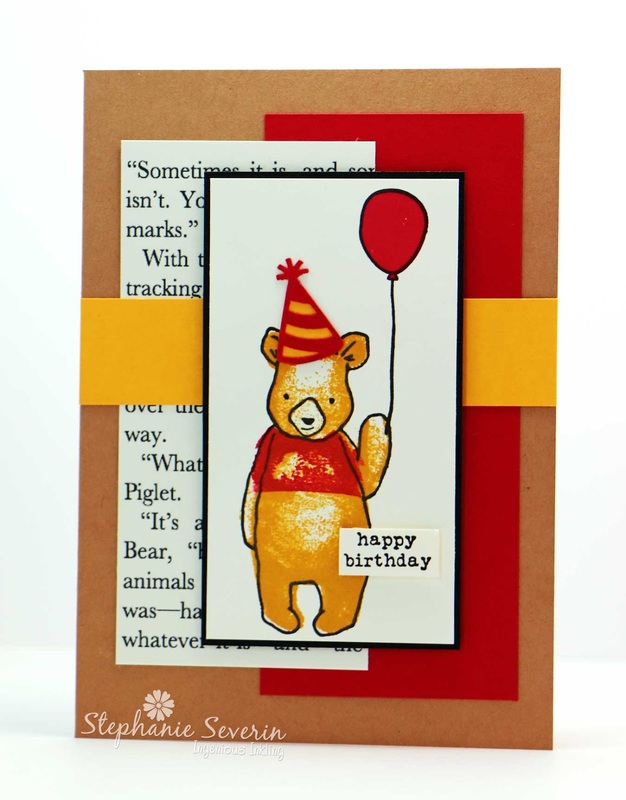 The Happy Birthday is from the same Concord & 9th Hi There Bear set. And of course, I couldn't resist adding a vintage Martha Stewart Punched Party Hat to his head. Thank you for taking the time to comment. Copyright 2015 . Simple theme. Powered by Blogger.